Ann Celeen Dohms, 81, of N Montgomery Street, Port Washington died unexpectedly Friday, June 4, 2010 at Columbia St. Mary’s Hospital – Ozaukee Campus in Mequon, Wisconsin. She was born on July 7, 1928 to Nicholas E. and Marie A. Stoelb Dohms in Sheboygan. She attended Holy Name Grade School and Sheboygan North High School. In 1944, after her sophomore year she entered the convent of the School Sisters of Notre Dame. After her novitiate she was assigned to various parishes in Milwaukee and Appleton, Wisconsin; Gary, Indiana and finally to Notre Dame of the Lake in Mequon, Wisconsin. While teaching in Milwaukee she attended Mount Mary College where she earned a Bachelor of Arts degree with a major in voice. She took additional training at Lawrence University in Appleton, Wisconsin. After being transferred to Gary, Indiana, she worked on her Master’s Degree in voice at Roosevelt University in Chicago. In 1962, she was transferred to the Mother House in Mequon where she taught music for 5 years. She then left her religious order and in 1968 she became the Director of Music and Music Teacher for St. Mary’s Parish in Port Washington. She retired from teaching in 1988 and remained as Music Director and Choral Director until 1995. She had taught part-time at Thomas Jefferson Middle School and Dunwiddie Elementary School in Port Washington. She played at numerous parishes more recently including St. Peter of Alcantara and Grand Avenue United Methodist Church both in Port Washington, St. Killian’s Parish in Hartford and Holy Angels Parish in West Bend. Devoted to music from an early age, she was proud of her published compositions, from Masses to Children’s Hymns, among others. She taught many students from her home throughout the years and continued to be a student. 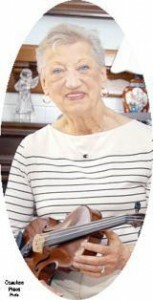 She took up the violin at the age of 77 with her teacher and dear friend Mrs. Joan Rooney. She was a devoted mom and grandma, proud of her daughter and grandson. Always sharing her talents with others, she continued to play at Sunday masses, weddings and funerals throughout her busy career. She is survived by her daughter Ann Marie Dohms, her grandson Grayson Dohms, both of Port Washington; two sisters Sr. Margaret Mary Dohms SSND of Elm Grove and Letty (the late Michael) Singh of Rocky River, OH; two brothers Daniel (Diane) Dohms of Sheboygan and Jim (Caroline) Dohms of Rothschild, WI, her dear friend Joyce Heinen of Port Washington, numerous nieces, nephews, other relatives and friends. She is preceded in death by her parents and two sisters Virginia and her husband Hank Netter and Sr. Danielle Dohms SSND. Reverend Thomas Lijewski will celebrate Mass of Christian Burial 10:30 Saturday, June 12, 2010 at St. Mary’s Catholic Church, 430 N. Johnson Street, Port Washington. Visitation will be 3-7 PM Friday June 11 at the funeral home with a 3PM Rosary. Visitation will also be from 9-10:15 AM Saturday June 12 at the Church. Entombment will take place at St. Mary’s Cemetery, Port Washington. A memorial fund has been established in her name.